Visible Ink Press : This superhero was inspired by the Roman god Mercury. This superhero was inspired by the Roman god Mercury. He was created by DC writer Gardner Fox. He has had two alter egos, Barry Allen and Jay Garrick. Atypical of the genre, many of the comic books featuring him have been very light-hearted and humorous. His super power is super speed. In an industry characterized by almost constant change, it is reassuring that the Flash has stayed true to his comics roots, even through his three different incarnations. The first version of the character was as DC Comics' fifth superhero (tying with Hawkman for the honor) and as the first super-speedster in comics history--though of course Superman was also rather quick on his feet. The Flash's origin in Flash Comics #1 (January 1940) recounts how student Jay Garrick is experimenting one night in the lab at Midwestern University when he is overcome by "hard water fumes" and passes out. Reawakening weeks later, he finds that he can move incredibly fast and is even able to pluck a bullet out of the air. ("Swifter than the speed of light itself--faster than a bolt of lightning in the sky--is the Flash!) In an unusual display of self-aggrandizement, his first action is to play on the college football team, single-handedly winning the game and impressing the socks off his girlfriend, Joan Williams. 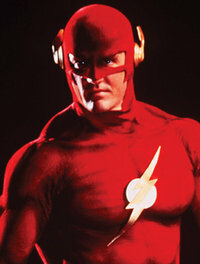 The strip's creator, writer Gardner Fox, was inspired by Mercury, the Roman god of speed, and the Flash shared Mercury's winged helmet and boots, combined with a red shirt and blue slacks ensemble, topped off with a lightning-bolt insignia on his chest. For its first few years, the strip was rather lighthearted in tone, reflected in the cartoony art of Harry Lampert (who co-created the character) and Everett E. Hibbard, and in adventures that pitted America's beloved hero against witches and fairies. He also acquired some bumbling assistants--the Three Stooges-inspired Winky, Blinky, and Noddy--who eventually got their own strip in All-American Comics. After World War II, the Flash's more comedic elements were downplayed by new editor Julius Schwartz who, along with writers John Broome and Robert Kanigher, introduced a colorful lineup of supervillains into the strip. These included the Ragdoll, the Thinker, Star Sapphire, the Fiddler, and the flirtatious Thorn (who was deemed too suggestive by DC's management and promptly banished from the feature). Visually, the introduction of dynamic young artists Carmine Infantino and Joe Kubert ensured that the strip was one of the most attractive of the Golden Age (1938-1954). The powerful simplicity of the Flash's powers--What kid wouldn't want to be the fastest runner in his school, for instance?--made him one of DC's top sellers. In addition to Flash Comics, he was also featured in All-Flash Comics, Comic Cavalcade, and as a member of the Justice Society in All Star Comics, making almost 200 appearances altogether. Only Superman, Batman, and Wonder Woman made more appearances than the Scarlet Speedster, as he was nicknamed. Jay Garrick's last Golden Age adventure was in All Star Comics #57 in 1951, but a little more than five years later a new Flash hit the newsstands in what was to be one of the pivotal moments in comics history. Showcase #4 (September-October 1956) introduced police scientist Barry Allen, who suddenly acquired superspeed powers when a lightning bolt hit his chemical cabinet, drenching him with a cocktail of chemicals. Inspired by an old copy of Flash Comics, Allen made himself a red, rubberized costume that could compress itself into a chamber in his ring, and suddenly a new Flash was born. Like Spider-Man's alter ego Peter Parker (still to come), Allen exemplified the irony of real life outside of a costume: As the Fastest Man Alive, he could run faster than the speed of light, but as Barry Allen he could never show up for a date on time. After the postwar collapse of the genre, there had been the occasional attempt to revive the superhero concept, but the Flash was the first revival that actually worked, and its success single-handedly inspired the Silver Age comics boom (1956-1969). The team behind the new Flash included the same people who had worked on him before, namely Schwartz, Kanigher, Broome, and Infantino; all had matured and improved, especially artist Infantino, who brought a sleek sophistication to the strip. After four issues of Showcase, the Flash was given his own comic in 1959, resuming numbering at #105,the point at which the previous Flash Comics had been canceled. Both Flash alter egos, Barry Allen and Jay Garrick, shared several common features: they were both scientists, both had girlfriends who knew their secret identities (though Barry kept his girlfriend Iris West guessing for several years), and both were laid-back, mature, almost fatherly figures. As before, the new Flash strip cleverly sustained the lighthearted tone of its stories, mixing humor with adventure in a way that was quite unique for the time. Again like the Golden Age Flash, the new series featured villains by the score, more so in fact than just about any other superhero comic. Over three decades, the Flash pitted his wits and his fists against his rogues' gallery, including the Mirror Master, Super-Gorilla Grodd, Professor Zoom, the Pied Piper, the Weather Wizard, the Top, Captain Boomerang, Abra Kadabra, the Trickster, Captain Cold, and Heat-Wave. In fact, where most stories embraced "relevance" in the 1970s, or became dark and violent in the 1980s, the Flash remained, for the most part, the same. Similarly, he had a remarkably stable creative team: Infantino drew the series until 1968 and then returned in the early 1980s, while Irv Novick drew most of the other issues; Broome and Kanigher were replaced by Cary Bates, who then wrote the comic for more than ten years. While Barry Allen and Iris West never actually had any children in the book's original run (they were married in 1966), the series nevertheless acquired its own family of sorts. The first arrival was Wally West, Iris' kid brother, who was awarded his own superspeed powers in Flash #110, in a repeat of the original accident while he was visiting Barry in his lab. He thus became Kid Flash and accompanied the Flash on numerous adventures, before later going on to join the Teen Titans. Ralph Dibny, the Elongated Man, introduced himself two issues later and teamed up with the Flash on many occasions, as did the Green Lantern, and a long-lost friend: Jay Garrick, the original Flash. Garrick re-entered the comics world in Flash #123, ten years after his last appearance in print. The popularity of that issue led to the gradual reintroduction of many other Golden Age heroes, including the Justice Society of America. From 1976 on, Garrick has been a stalwart of numerous Justice Society comics and crossovers, and remains a treasured star of the DC universe--which is more than can be said for Barry Allen. The 1970s were a hard time for a lot of DC's Silver Age warriors, and although the Flash weathered the storm, as the years went by his world began to crumble away. First, his beloved Iris was murdered by Professor Zoom, who in turn was later killed by the Flash, leading to years on the run and a tumultuous court case. (Professor Zoom has since returned alive, of course.) In 1985, his comic was canceled (with issue #350) and finally, in the Crisis on Infinite Earths miniseries, poor old Barry died trying to save the planet. At this point, DC decided to let the sidekick take over--to date the only time this has happened--and in 1987, Wally West, Kid Flash, became the one and only Flash. West was a different, edgier, and more youthful Flash; he shared none of his mentor's modesty and reticence. He was brash, bold, and somewhat self-centered--the perfect hero for the 1980s. West was not as quick as Allen and needed to consume vast quantities of food to keep going, but luckily money was not a problem, since he had won the lottery. While initially trying to steer things away from the old Flash, the comic's various writers, including William Messner-Loebs and Mark Waid, soon found themselves bringing back the old villains one by one, proving that what worked in the 1960s could work just as well in the 1990s. The new decade also brought with it an entirely unexpected development: The Flash television show that ran for twenty-two episodes on CBS in the 1990-1991 season. John Wesley Shipp made a charismatic Flash, and Amanda Pays, who portrayed Dr. Christina McGee, a convincing pseudo love interest who knew about the Flash's secret identity. David Cassidy played the Mirror Master and Mark Hamill portrayed the Trickster. With story editors from the comics industry (Howard Chaykin and John Francis Moore), a budget of $1 million for each hour-long episode, and unprecedented special-effects techniques, The Flash redefined the way that superheroes had previously been portrayed on television. Critics cite the poor time slot (opposite NBC's The Cosby Show and Fox's The Simpsons) as the reason for the show's brief lifespan. Today's Wally West has surrounded himself with his own cast of thousands, including interdimensional pal Chunk and Korean-American journalist (and future wife) Linda. For the most part, however, his companions are fellow speedsters, such as Johnny Quick, Jesse Quick, Jon Fox (the Flash of the twenty-seventh century) and the "Zen master of speed," Max Mercury (formerly the Golden Age hero Quicksilver). The most significant hanger-on has proved to be Impulse (introduced in Flash vol. 2 #92), a hyperactive speed demon from the thirtieth century, sent back in time to counteract a fatal super-aging disease--and to learn how to "chill out," with the help of Max Mercury. The hyperkinetic Impulse struck a chord with fans and was soon granted his own comic (1995-2002) and a starring role in the Young Justice group (1998-2003), though perhaps his enduring legacy will be as one of the first major DC characters drawn in a Manga-inspired style. Barry Allen, the Silver Age Flash, finally returned to life in Final Crisis #2 (August 2008) and then starred in the miniseries The Flash: Rebirth (2009), written by Geoff Johns and drawn by Ethan Van Sciver. Barry Allen then starred in a new The Flash comic that began in 2010, and was a principal character in DC Comics' 2011 event miniseries Flashpoint. Yet another new The Flash comics series starring Barry Allen in the title role was launched in September 2011, with Francis Manapul and Brian Buccellato collaborating on both writing and art. The Wally West version of the Flash appeared in an episode of Superman: The Animated Series and was a regular cast member, voiced by Michael Rosenbaum, in both the Justice League and Justice League Unlimited animated TV series. Jay Garrick as the Golden Age Flash, Barry Allen as the Silver Age Flash, and Wally West as Kid Flash all appear in the animated series Batman: The Brave and the Bold.